You’re already making a great decision by using oil heat in your home, so why entertain the hassle of manually scheduling your heating oil delivery? This blog post will outline the many reasons for using automatic oil delivery. Imagine a scenario in which you keep pushing off scheduling an oil refill. 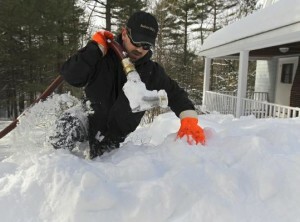 All of a sudden, you get word of a snow storm that is to sweep in through the weekend. You would like to stay calm and just ride out the storm at home, but your heating oil tank is at 1% capacity. Because you did not enroll in automatic delivery, you put yourself in a risky, slippery, and cold situation. Automatic oil delivery is a fantastic option for those who don’t wish to worry about the hassle of calling us to schedule a tank refill. Those who opt for automatic delivery receive their deliveries based on a schedule that we determine with our advanced and proven degree day system. Whether you need heating oil now or refill at the same time every year, the Bigelow Energy team stands ready for an on-time heating oil delivery 24/7. We offer next day delivery for eight nearby communities and scheduled delivery for all of the greater Boston area. As outlined above, customers who opt for automatic oil delivery need not be subject to any harsh weather. In fact, we take strides to automate our delivery schedule using a sophisticated computer modeling system known as degree days. This system takes into account your personal specifications, including oil tank size & age, size of your home, whether or not your hot water is sourced from heating oil, and day-to-day outside temperatures. Bottom line, our system is here to ensure you that you will have sufficient oil supplies when you need them! New Customer Tip: Automatic Heating Oil Delivery Customers Receive Two Free Years of our Heating System Comfort Plan. Bigelow Oil has been a family owned and operated business in the Boston area for over 65 years, so you can guarantee the professionalism and reliability of every HVAC service technician. As experts in the industry, we understand the ins and outs of home heating, and always offer year-round maintenance and tune ups. In fact, we’re so dedicated to your experience, that we offer every new automatic delivery customer two FREE years of our Heating System Comfort Plan. As an added bonus to enrolling in automatic oil delivery service, all customers receive two free years of our Heating System Comfort Plan. This specially catered plan offers guaranteed 24/7 emergency heating service, top priority routine service, complete furnace/burner tune-up, free replacement and repair for basic parts, and 5% off heating equipment installation. There is no comparison when it comes to heating your home. Peace of mind free of scheduling oil refills, satisfaction from our hand-selected service engineers, and two free years of our Heating System Comfort Plan. All of these benefits are achieved with an automatic heating oil delivery plan.